“It all started with a drawing on a napkin, while eating lunch with a friend, that turned into a $200,000 expansion over 3 years”. Scott Rogers puts the growth of the College of Southern Idaho’s Challenge Course into such a simple perspective. The CSI Challenge Course is a substantial ropes course construction on the College of Southern Idaho campus comprised of wooden poles 50 feet tall and connected and intertwined with steel cables, pulleys, wooden boards and planks, and ropes and tires to create an obstacle course designed to provide individuals and groups with the opportunity to learn and grow by experiencing challenges they might not face on a daily basis. The common theme is for participants to “get out of their comfort zone” and grow both mentally and physically. What began as an extra-curricular activity obstacle course has morphed over the past 20 years into the largest pole-built ropes challenge course on a college campus in the entire world. With over 40 high elements and countless low elements, Rogers has devoted his extra time outside of his “day job” teaching at CSI to fostering the programs growth. “The program is designed to challenge participants both mentally and physically in order to bring about personal development.” Rogers states. “The program consisted of group initiatives, low ropes elements, and high ropes elements. While the challenge program was designed for participants to develop trust in each other, appreciation of individual styles and talents, and reinforce communication skills, feedback skills, and support. Rogers began his educational career at Idaho State University, graduating in 2004 with a Bachelor’s in Physical Education. After following up with his Master’s thru Bowling Green, Rogers is slated to finish his Doctoral degree in 2019. 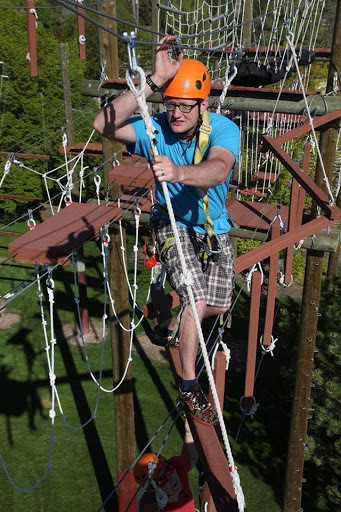 Rogers began as a facilitator on the Challenge Course in 2004 and has since become the director, continuing to facilitate groups as well as maintaining the day to day operations and in teaching new staff the proper safety and technical procedures. One main goal that Rogers has been working diligently to achieve is integrating the idea of Experiential Education into the curriculum of the CSI campus, and to promote this educational style to other schools and institutions, showing just how important and effective experiential education can be. With groups ranging from grade school clubs and community organizations to corporate departments and scholastic sports teams, people from any walk of life can benefit from leaving the comfort of their daily lives and become exposed to new and exciting experiences. When I first met Scott, I was new to any type of climbing and obstacle course activity, and truthfully, I have always had a pretty decent fear of heights. When a position opened up on the course I took it without thinking of the ramifications, as I thought it was just a job and I would make a bit of extra money. From beginning as a manual laborer setting up obstacles and carrying equipment to over 4 years later where I now facilitate groups and have a hands-on part in the construction of the course, I have seen my life change through experiential education. Of the hundreds of participants, I have had the privilege to teach and work with, to the countless hours I have spent learning about people and challenging myself to overcome my own limitations, I owe a great deal of this experience to Scott Rogers. From a first-hand account, if you ever have the chance to take a weekend trip or find yourself in Southern Idaho near the CSI campus, make the time to contact Scott Rogers and the CSI Challenge Course. If even for a few hours, get out of your comfort zone and see just what Scott and the course have to offer. It is definitely life changing, I am proof of that.